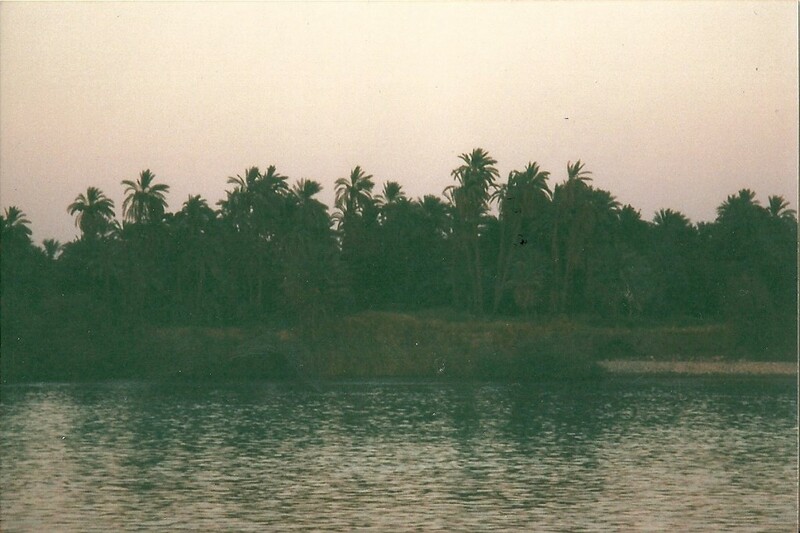 In 2002, I traveled to Egypt. I joined a woman who had told me this would be a group of belly dancers. It turned out to just be her and me; due to the World Trade Center Towers terrorist take-down one year before, everyone else cancelled the trip. It was pretty strange traveling with “Nur”, the guides she had engaged were wonderful and part of the itinerary was to fly to Luxor and take a river cruise boat on the Nile from Luxor to the Aswan dam. We joined a group of ten, all personable, interesting people: three Americans, a Tunisian of French heritage, a Parisienne, a Norwegian couple, two young Brits and her crusty old Scottish father. I had enjoyed the incredible Pharoahnic temples, and was’d been utterly in the spell of the beautiful scenery along the banks of the Nile. Waking up, wonderfully relaxed, in the late afternoon, I could see the banks of the river through the window, so much closer than before. The Nile was narrowing as we chugged southward. I climbed the stairs to the back deck and found an idyllic scene. Nora, the Algerienne, lounged on a deck chair, her neck resting against the back, her slender leg extended on the low wicker table. 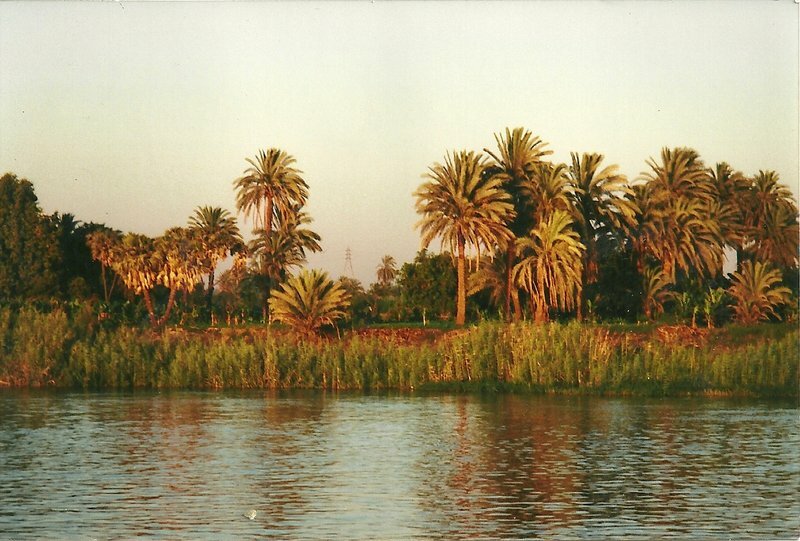 The French girl was sprawling in a similar manner, as they both gazed at the crowded palms and grasses on the banks of the Nile, so close to the boat, and so beautiful in the late-afternoon light. Arabic music (for a change) was playing softly on the speakers. I sat down at a nearby table. “It’s so peaceful,” I said shyly. Nora Ourabah leaned back her curly auburn head with a lovely soft smile on her delicate features. “It’s one of the best moments”, she said. We watched, as if under a spell, as the banks slowly changed from that beautiful golden light that happens so briefly at sundown; dark olive shadows and green, reflected in the slightly rippling waters, along with the pale gray-blue of the sky. We continued to watch until the vegetation was so dark that one could not make out the shapes of the individual trees. The shore seemed ominous with mystery, so still and quiet as we chugged by. The waters mirrored the murky shadows, with hazy dark upside-down reflections of the tallest palms. Out from the shore, the river mirrored the pale gray sky, the entire surface dimly shimmering with darker indentations, giving it the luminous sheen of old silver. As we left to go down to dinner, I commented to them on how nice it was to have the Arabic music for a change. She told me that they had gone to the upstairs bar and asked if they could have the music changed. She said that she told him they didn’t come all the way to Egypt to listen to European music! This entry was posted in Egypt on December 2, 2014 by Laviajera1.